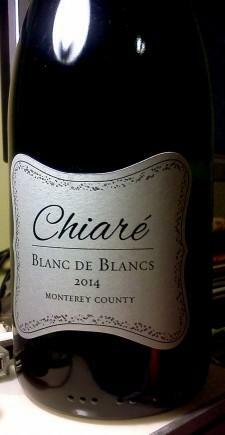 The Chiare Blanc de Blancs 2014 is a $6.99 ALDI exclusive (this is a seasonal Sparkling wine that sold for $9.99 during the holidays) made from Pinot Blanc, Riesling and Muscat grapes grown in Monterey County, California. This is a Sparkling wine produced with the Charmat Method, the same technique used to make Prosecco. The second fermentation (that is where the bubbles occur) takes place in large pressurized vats (that keeps the bubbles that are produced from 2nd fermentation integrated with the wine and not dissipating into the air). Blanc de Blancs is a Champagne term (even though this is Charmat Method and not a Champagne Method Sparkling wine) and it means white (white wine) made from white (white grapes). Pinot Noir is often used in Champagne and that is the way to say that a particular bottling was all Chardonnay and maybe Pinot Meunier and no Pinot Noir. A single AVA, vintage specific, Sparkling wine is seldom found for under $10. The alcohol content is 12%. The color is golden-yellow with medium-sized energetic bubbles. The nose is peach, apple and citrus, delicate and lightly floral. Upon first sip, there is a burst of sweetness to this Bubbly that becomes dry by the mid-palate. It tastes of apple and lime, with a pronounced brush of minerality. The mid-palate shows lemon and a late slap of grapefruit. The acidity is in balance. The finish is soft, but does linger. Well ALDI, this is a most pleasant surprise, the Chiare Blanc de Blancs 2014 is an eclectic, unique Sparkling wine. This is an oysters on the half shell kind of Bubbly selling for a two bucks more than Cold Duck and Andre’s. I don’t know how much of the Chiare that ALDI has left since $6.99 seems to be a close-out price, but the Chiare is a Sparkling wine that is well worth twice the price.